Terrabite is a Bug/Ground-type Pokémon. It does not evolve. Terrabite rotates its body and swims through desert sands as if they were water. It hides under the sand and leaps up to chomp its prey. The largest Bug-type yet discovered, its jaws are terribly powerful. In olden times, desert nomads would fear getting swallowed by these Pokémon. Terrabite is based on an earthworm, but more specifically it is based on the fantasy and science-fiction idea of giant sand-dwelling worms, such as the Sandworms from Frank Herbert's Dune. 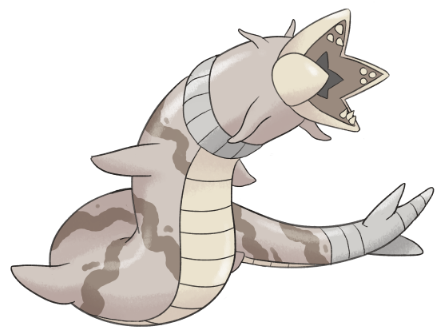 It has hagfish barbels around its face and fish-like fins on its sides to help it swim through sand. Its striped patterns and ribbed underbelly are based on worm tracks and the camouflage of the desert horned viper. Etymology: terra (Earth) + bite; a pun on terabyte, a unit of information.